I got to play a video game that came back from the dead and feel pretty hopeful about its resurrection. That's because Sleeping Dogs might just fulfil a very specific desire of mine, which is to play through a video game that takes its cues from the movies of, say, Johnnie To or Chan-Wook Park. Desperation, vengeance and duty all come together in hypnotic fashion when you watch a crime thriller from countries like Hong Kong or Korea and the recipe for crazy action is one that's ripe for translation into video games. For all its stylised gunplay, the buggy Stranglehold didn't scratch that itch for me, no matter if John Woo worked on it. So I've been waiting, patiently, for something that will. Sleeping Dogs started life as True Crime Hong Kong — developed by Vancouver-based United Front — and was unveiled to the world in a splashy fashion during the 2010 Spike Video Game Awards. Despite that high-profile reveal, Activision unceremoniously scuttled that game. Square Enix acquired the title last year and has been hyping it with gritty mini-movies meant to evoke the Asian crime cinema oeuvre up that the game's drawing on. The two levels I recently played definitely could've been outtakes from an Infernal Affairs movie. One starts in the kitchen of a bustling restaurant as lead character Wei's getting orders to pound on some fool who's run afoul of the mob boss he's working for. As I steered the undercover cop through a frantic foot-chase in Hong Kong's chaotic crowded streets, I hurtled food stands, scrambled up neon signs and jumped across rooftops. This city felt alive in a different way. Catching up to my target, I then had to face waves of thugs from his rival gang. The fighting felt responsive and came across with a brutality that surprised me. Another sequence I played had Wei street-racing against another Hong Kong wise guy with two girls along for the ride. 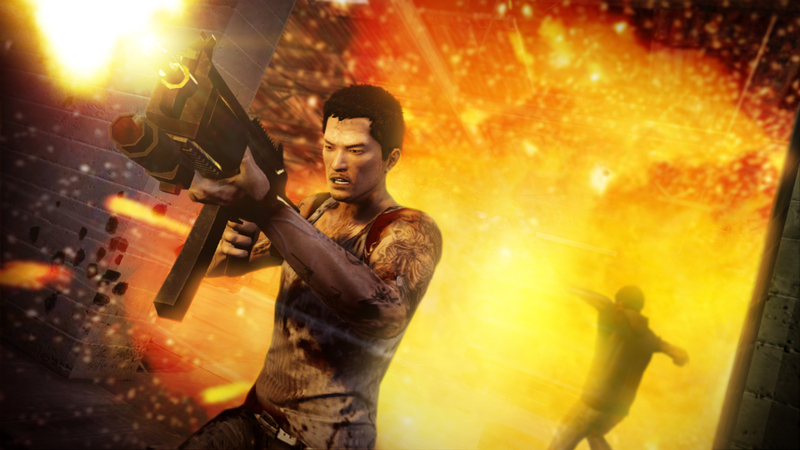 It's here that I need to say that Sleeping Dogs isn't going to be a revolutionary game. The fighting recalls the one-button fisticuffs of Rocksteady's Batman games, explained by the fact that members of the Square Enix London dev team worked on Batman: Arkham Asylum. And the driving will be familiar to anyone who's played recent racing games from EA's Black Box studio, since some United Front members came from that collective. Yet, open-world games suffer by having too many things to present all under the same engine, but Sleeping Dogs looks like its various activities will be operating on the same level. You're not going to groan when a driving mission comes up and won't feel clumsy when it's time for a fistfight. But what's really piqued my interest about Sleeping Dogs is the punchiness of its dialogue and the sharpness of its presentation. The delivery of the threats and cussing made me pay attention and didn't feel like phoned-in line readings. The rival I raced against was sleazy and believably reptilian, muttering under his breath as we lined to drag. It's the attention to these little touches — along with a solid gameplay skeleton — that makes me think Sleeping Dogs deserves its second shot at life. I can only hope that I can nail a crotchety old Triad leader into a wooden crate and kick it down a hill, like in Johnnie To's Election. If the game can capture the morally aloof outlaw cool of the world's best gangster movies, then its August debut can't come soon enough. I knew they wouldn't let True Crime HK die. This game is going to be epic.